He was a dapper figure on the slopes, skiing in a shirt and tie plus a Scottish tam on his head. 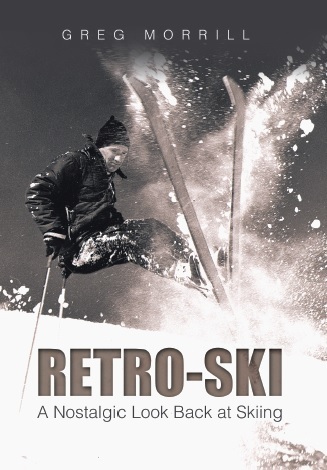 His skiing style was pure RetroSki: skis locked together with exaggerated counter-rotation of the upper body. Then there was his infectious smile with sparkling blue eyes highlighted by bushy, white eyebrows. Although there was nearly a 30 year difference in our ages, Jim and I had some things in common. Both of us had moved to Vermont to work for IBM and ski, with the emphasis on “ski”! Both of us loved to talk skiing. Even on the hottest day in July I knew all I had to do was drop by Jim’s office and we could talk skiing. Jim would retire from IBM and I would move from Jeffersonville, but our paths would continue to cross over the years. Jim was on the ski patrol at Smugglers. Anytime I happened to ski midweek at Smugglers when he was patrolling, he’d recruit me to help with sweep. That usually meant I’d get Doc Dempsey’s. Jim was more a “cruiser” than a “bump basher”. Later in the 1980s I ran into Jim skiing Stowe. He had turned seventy and could ski Stowe for free! Jim became my hero and I had a life goal. Patty wasn’t sure when the benefit was discontinued except that it would have been after Sepp’s death in 1990. So far no one has been able to pin down the exact year that the policy was changed, but it had to be sometime between 1990 and 1995. Back to Jim Thompson. Jim’s daughters tell me he did not take kindly to the loss of his lifetime free skiing benefit at Stowe. But apparently by 1996 he had recovered. When I started Hosting at Stowe who else was already a Stowe Host? Jim Thompson. 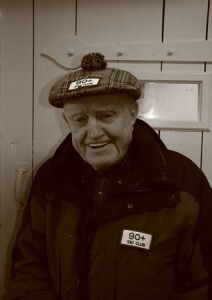 Jim would turn 80 while still being a Stowe Host and I had a new life goal: still be actively skiing at 80. 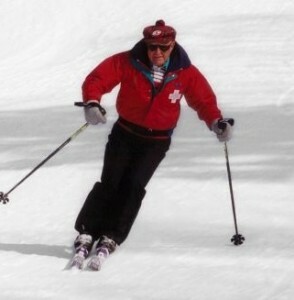 Jim would continue skiing until he was 93. That’s a goal I can’t realistically set for myself. Jim passed away on October 27th at the age of 97! We all have skiing heroes who inspired us. Some are famous personalities with recognizable names and some are personal with less well-known names. Jim Thompson was one of my skiing heroes! Greg: Thanks so much for writing this fine tribute to Jim. He was a grand guy; an old fashioned gentleman in the best sense of the word. I met him as a Host and we shared many talks of the time he was with IBM in the Hudson Valley, when he, like many of us locals, skied an area called Highmount on the back side of BelleAire. In his later years, when he left the Hosts and concentrated on Smugglers (his true love) I’d see him occasionally, always with a shirt and tie, sporting his tartan tam. His warmth and friendly spirit were contagious.